Question From Reader: Why Not Follow The Trend ? I love your updates, please keep up the good work! My question is the following: Obviously we are in one of the worst bear markets (stocks) we have seen in a long time and all of the experts tell us novices that you MUST go with the major trend of the market and not fight the urge to go the other way. Yet it seems you have been looking for places to go long all the way down INSTEAD of trying to find places to go short (go with the MAJOR TREND) and I can’t figure out why? I’m sure you don’t care how you make $$ whether it be long or short….During the bull trend you looked for buying opportunities and yet in this bear trend you also looking for buying opportunities…. what would it take for you to write about looking for shorting opportunities? what would the market have to do for you to see every rally as a selling opportunity instead of every decline being a potential buying opportunity? Thanks Jim. I took a short hiatus for the Easter holidays but I’m back. So let’s see about “keeping up the good work” and answering your questions. First of all, you are right. Following the trend is a good idea. Especially if you’re just starting out. But let’s take a step back and realize that there are really only three types of trades. Either method is fine, as long as you have positive expectancy and good money/risk management. I don’t agree with what you say about this decline though. We can barely call it a true bear market since we just grazed the -19% mark from the top in October to the recent low. In any case, although it certainly feels brutal because of all the bad news flying around, I don’t think we are anywhere near the necessary proportions to call this the worst bear market we have seen in a long time. So the short answer is that it comes down to style which of the three methods you want to pursue. The long answer is that I’m a masochist (kidding!). As for what would it take for me to go short in this market climate, that’s a good question also. I would be trying to short rallies and sell into down trends if the technical and sentiment measures I watch show that even as the market has declined, it has room to decline further. Here’s what I mean. Let’s say we have a serious move down but the put call ratio doesn’t really budge. Or horror of horrors, it actually moves down slightly! Or let’s pretend that after a waterfall decline, retail investor’s sentiment either doesn’t get gloomy or actually improves! Those kinds of things would make me reassess how I see the market. But today we are seeing the opposite. We already know that sentiment is absolutely horrible with the complete spectrum of market participants disgusted with the current market. We already know that people are afraid due to the put call spike we saw and we know that the market reached “washed-out” levels of oversold. On top of that, when we do rally strongly for a few days, we immediately see people question it or dismiss it outright. 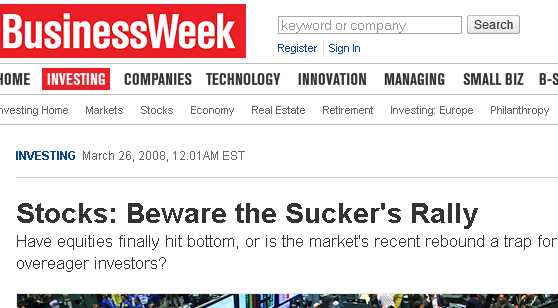 Take a look at this recent article from BusinessWeek: “Stocks: Beware the Sucker’s Rally” Again, this confirms the abysmal sentiment out there. And in the crazy upside down world of contrarian analysis, it is exactly the sort of thing we’d prefer seeing (as longs). And if you have a question or comment, please remember to write it on the relevant blog post… unless it has nothing to do specifically with what I have written. In which case, you can contact me. Compliment, a very good blog ! Very interesting the posts on sentiment. They introduce elements that I had never taken into consideration so far. It is just two years that I am investing in the stock exchanges, and your posts certainly help, who like me, is still at the beginning. A curiosity : if I have well undestand, you think that the last bullish wave ( onda 5 ? )( before the beginning of the true bear market ) is yet to come ? Ii still missing the classic panic buying, the speculative bubble has yet to come out and to burst. Lorenzo, it sounds like you’re referring to Elliot wave stuff. I’m not well versed in it nor do put much stock into it. The short term is difficult enough to grasp, never mind the really long term!